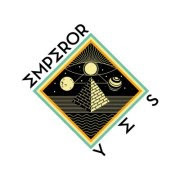 Not much has been said about Emperor Yes yet, the new project from Adam Betts of Three Trapped Tigers, Ash Gardner who has recorded the likes of Noah & The Whale and Mumford & Sons, and Hugo Sheppard (formerly of metal outfit To-mera). The mish mash of influences has given birth to a synth-heavy, experimental pop sound that sounds a bit like the second coming of The Postal Service. The band have clearly been gestating for sometime, with their first five demos going up all at once on Friday. A selection of musicians have contributed to the tracks as guests, including other members of Three Trapped Tigers and Jeremy Warmsley of Summer Camp. Judging by the excellent end result, the contributions have been most welcome. The demos typically have a pleasing foundation of synth-pop with added flourishes, such as on the likes of 'Carl Sagan' with its prog ambitions and the psychedelia of 'Trees And Coral'. I'm particularly a fan of the ethereal Animal Collective vibe on 'Fish' as well as the quirky synth-pop 'Wasps', which reminds me a great deal of my favourite Irish hit-makers Fight Like Apes. It's an exciting start to Emperor Yes. Or the start of something exciting. Or both. Listen to the five demos in the Soundcloud widget below.